Experience the magic of The Nutcracker every holiday season with the full-length production featuring students of the Oakville School of Classical Ballet under the Artistic Direction of Amanda Paterson. A total of five performances are presented, giving the students invaluable performance exposure. Performed to Pyotr Ilyich Tchaicowsky’s beautiful music, this ballet has been Oakville tradition for over 30 years! It’s Christmas Eve, a time when dreams come true, and the Silberhaus family are holding their annual Christmas Party. Presents are exchanged, and among the many gifts Clara receives is a Nutcracker from her magical godfather, Herr Drosselmeyer. The guests dance, and the children play, and when the party is over Clara goes to bed and begins to dream of an adventure. In her dream, the Nutcracker fights a battle with mice, and transports Clara and her brother Fritz on a sleigh, through the Land of Snow to the Land of Sweets . In the Land of Sweets they meet the Sugar Plum Fairy and her Prince, as well as dancers from faraway places. The ballet closes as Clara wakes up in her living room with her Nutcracker, treasuring her wonderful dream. Spectrum provides the Pre-Professional, Professional and Conservatory Programme students a chance to showcase their accomplishments and talents in Classical, Contemporary and Character Dance. Spring year end school performances take place at the end of May. Students in the pre-professional and professional divisions perform in Spring Showcase. Students in the general division and all students in the school perform class demonstrations, in Spring Dance show. All performances are held at The Oakville Centre for the Performing Arts. 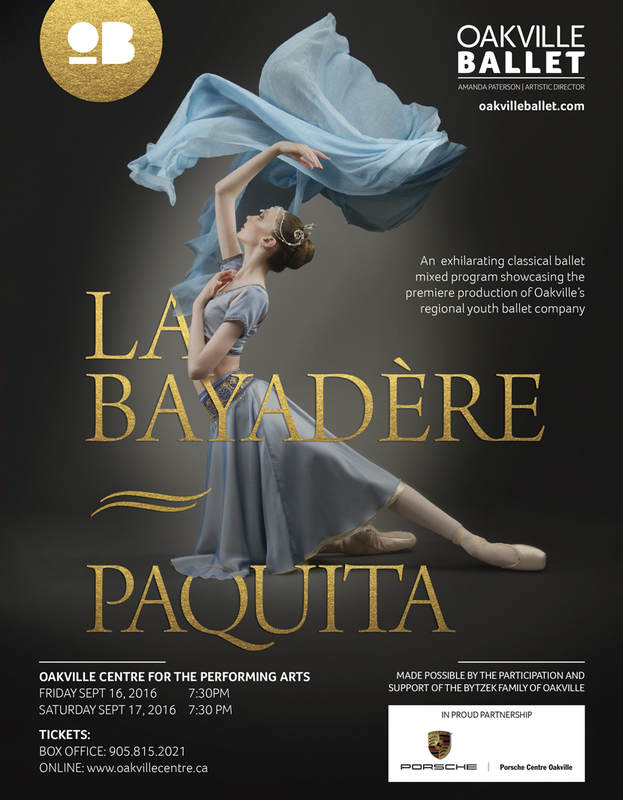 Oakville Ballet will premiere The Kingdom of the Shades excerpt of La Bayadère, and Paquita – Grand Pas Classique as the inaugural performances on September 16 and 17, 2016. These performance have been made possible by the participation and support of the Bytzek Family of Oakville. Combining two of the most iconic classical ballets as its premiere performance, Oakville Ballet endeavors to share with the audience the technical ability, physical athleticism and joyous determination of the young dancers. The program commences with La Bayadère, Kingdom of the Shades (1877), choreographed by Marius Petipa. Petipa is considered to be the ‘father’ of classical ballet and this particular scene is one of the most celebrated excerpts in all of classical ballet. In Act II, the Company will perform Petipa’s version of Paquita – Grand Pas Classique (1896), revised for the Imperial Ballet of St. Petersburg, and this version includes the famous grand pas de deux. Judith Yan, will lead the Oakville Ballet orchestra in the two-act ballet, set to the strong rhythmical scores of Ludwig Minkus. We run a number of open house weeks for prospective students and their parents. Contact us to attend a class. Call 905-302-Jeté (5383) or register your interest using the link below.